If you've ever wondered about the orange tent you see in our camping posts, today's your lucky day! It's the Big Agnes Copper Spur UL4, a four-person, three-season tent. It was my birthday gift in November, 2012, and it remains, hands-down, my favorite piece of camping equipment. 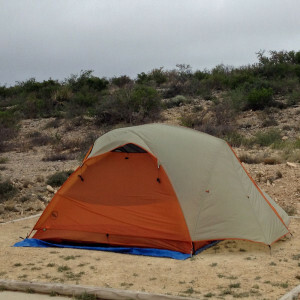 Living in Texas, I wanted a tent that would allow the breeze to flow and stars to dazzle me. I also wanted a tent that was big enough for my tall husband to sleep in comfortably. With two doors, spacious vestibules and considerable height, this tent has proven absolutely perfect for me. 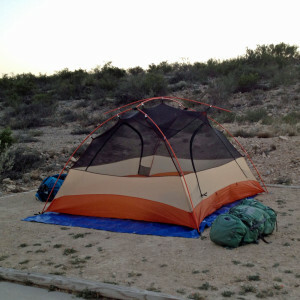 I give the tent a five-star review on Trailspace.com, so be sure to check out all the details there. I talk ease of setup, stability, weather resistance, ventilation, spaciousness, packability and more. I also point out a couple of minor design flaws — nothing is perfect, after all! Do you have a favorite piece of equipment? What qualities do you look for in a tent? Let me know in the comments.